Dr. Obade is Board-Certified in Orthopaedic Surgery by the American Board of Orthopaedic Surgery. He specializes in performing Minimally Invasive Orthopaedic Surgery including Arthroscopy, and Total Joint Replacement. He also specializes in the newer technologies such as Computer-Assisted Surgery and highly advanced, longer lasting Total Joint Implants. Dr. Obade trained at the University of Pennsylvania Medical Center in Philadelphia, and is licensed to practice medicine in New Jersey and Pennsylvania. 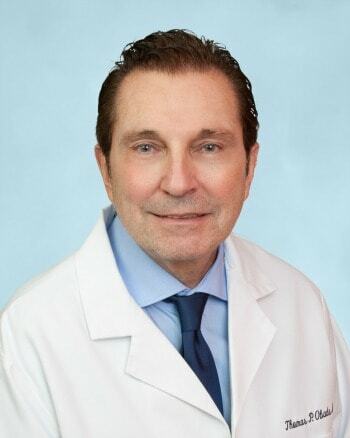 Dr. Obade is the former Chief of the Division of Orthopaedic Surgery at Underwood Memorial Hospital and is a past President of the New Jersey Orthopaedic Society, and a Fellow of the American College of Surgeons. He also serves as an orthopaedic consultant for New Jersey Medicare, member and past Chairman of the Arthroscopy Association of North America’s Ethics and Standards Committee, and was recently elected to serve a three-year term on the American Academy of Orthopaedic Surgeons’ Board of Councilors. Dr. Obade has lectured and taught at orthopaedic symposiums and seminars nationwide.